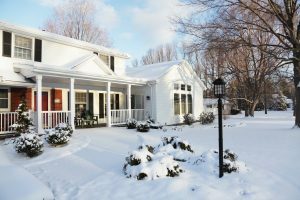 The full process of winterizing would involve fully purging the home’s plumbing system of water including emptying the water heater, draining all of the piping, and filling fixtures with an antifreeze solution. You must calculate your chances of a ‘hard freeze’ in your absence and decide what steps you need for the days you will be gone. If you have questions about water damage in homes or need some advice, contact a professional water restoration company that can answer your questions. Plumbing systems are subject to simple physics. Although cold temperatures cause things to contract, ice has more volume than water. When it freezes inside a line, it expands to increase the pressure inside. The increasing pressure must escape– it literally bursts right out of the pipe. This usually occurs at a weak joint in the copper pipe. Water damage caused by bursting pipes during cold weather can be devastating. If no one is home to shut off the water, an enormous quantity of water can flood a house and cause thousands of dollars’ worth of damage. The additional time before clean up begins will contribute to more mold growth. To prepare for a vacation, all exposed water pipes in cold areas like attics, garages, and crawl spaces should be insulated. Water supply for exterior pipes should be shut off from inside the house and then drained. Sprinkler systems are particularly vulnerable to cracking due to cold-weather expansion. If you have an indoor or outdoor pool, drain the water. Turn off and drain fountains and other sources of standing water. If a house is to be vacant for a long time, you may prevent water in a toilet’s trap from evaporating and permitting sewer gases by raising the toilet lid and seat and covering the bowl with plastic wrap. In addition to the plumbing system, take the time to unplug all non-essential electrical appliances, especially the refrigerator. If no electrical appliances are needed at all, electricity can be shut off at the main breaker. Winterize the A/C; since you will not use your air conditioner during the winter, take some steps now to extend the life of your system. Drain any pipes or hoses and vacuum out any water in the A/C’s drain pan. Then cover the unit to keep water and snow from rusting the metal components. If a pipe does burst in or outside your home, call Restore Rite, available 24 hours a day to clean up minor or major water disasters in and around Pocatello Idaho. Whether your water damage came in the windows, a broken pipe, or a hole in the roof, you will need professional, certified and experienced help. When a client calls with a water damage emergency, the team responds immediately. Experts assess the amount of damage and then create a plan of action to restore the property as quickly and efficiently as possible. Call (208) 782-4030 or visit restorerite.net for help preventing or cleaning up winter water damage in Pocatello, Idaho.